OnePlus’s Flagship killer, OnePlus Two comes with decent hardware as per the price. Although OnePlus 2 comes with a custom OS i.e Cyanogen OS, if you are a true Android lover, you will root your Android device to enjoy all the benefits of rooting OnePlus Two. Rooting allows Overclocking, Customizing, Installing Custom ROMs and much more. Most of the latest devices comes with locked Bootloader so, before starting with rooting OnePlus 2 make sure you have unlocked OnePlus 2 Bootloader. We need to Install TWRP recovery in OnePlus 2, to flash the SuperSU file. TWRP 3.0.0 has been released for OnePlus 2 (Two) so you can start with installing the latest TWRP recovery in OnePlus 2 to Let’s began with Installing Custom recovery and rooting OnePlus 2. Unlock Bootloader : How to unlock Bootloader in OnePlus 2. Step 1. Goto C: > android-sdk > platform-tools OR Where you have installed Android SDK. Now Hold the shift key and right click on the mouse in any black area in SDK Folder, you’ll find an option as “Open Command window here”. Click on it. If you are using Minimal ADB file, extract the downloaded zip file & launch command.bat file. Step 3. Connect your device to your PC by enabling USB Debugging mode (Settings>Developer Options) If you can’t find Developers options, Goto Settings > About Phone > Tap the build number for 7 times. Don’t forget to install the USB Drivers. Step 1. Download any recovery of your choice however, currently we are using TWRP 3.0 Recovery: Download. Step 2. Place the file in your fastboot folder (this is where fastboot.exe is located on your PC). Generally in C: > android-sdk > platform-tools. 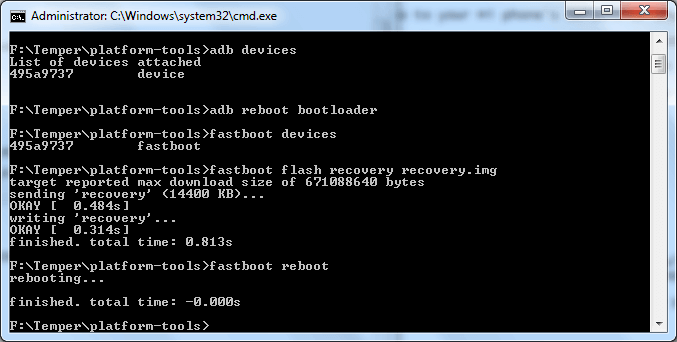 If you have Minimal ADB, just place the TWRP recovery in extracted folder. Step 3. Power off your phone & Again Power On by Pressing Power Button+ VolUp Button Simultaneously. This will boot your OnePlus Two in Fastboot mode. Step 4. Connect your phone to your PC via usb cable. Step 6. Type the below code in the command prompt / Terminal. Remove the usb cable after your device boots up. When Phone is ON, use Advanced Power menu. When Phone is OFF, press power + volume down button simultaneously. Step 2. 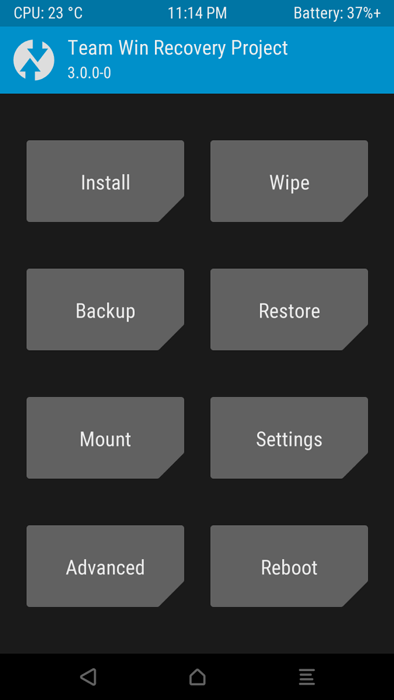 Enter into TWRP recovery via the advanced power menu (or power + volume down). Step 3. Select the ‘Install’ option from the TWRP home screen. Step 4. Navigate to where you have SuperSU stored on your sd card and select it. Step 5. Swipe to install. After installing SuperSU, you’ll have an option to wipe cache/dalvik and an option to reboot system. Once you have rooted your OnePlus 2, you can check best apps for rooted Android phones. You can now install Custom ROMs,Mods, Xposed Installer in OnePlus 2 If you have any questions, you can ask us in the comment section.